It is appropriate to visit Shiretokoiozan during the summer because during the winter and early spring and late fall, it is extremely cold and snowy. 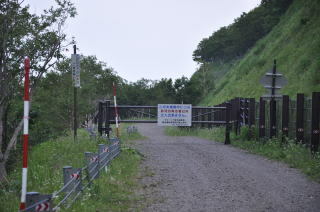 The Road etween Shiretoko Goko Lake Gate and Kamuiwakka Bus Stop is restricted some period during the summer, so you must check it befor visiting there. 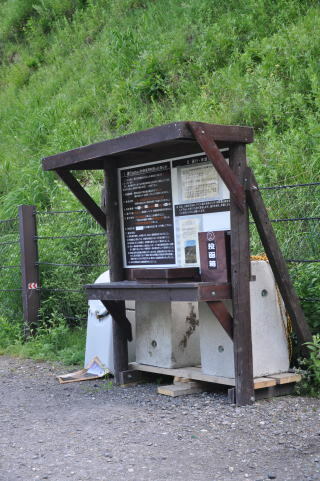 You would visit Kamuiwakka Bus Stop either by bus or rental car. 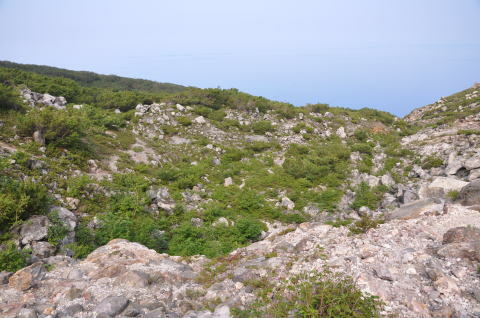 It would take one hour and a half to the Crater One from Kamuiwakka and it is extremely hot during the summer. So I recommend you to bring two litters of water with you. *The Crater One is called "Explosion Crater" by geologists but here I would like to use old name given by miners "The Crater One." When you get off the bus, you would see the bulletin board like the phtograph above. Open the box on the bulletin board. There are some pieces of paper in it. They are forms you must fill in to walk the 500-meters road ahead to the starting point of the mountain trail. 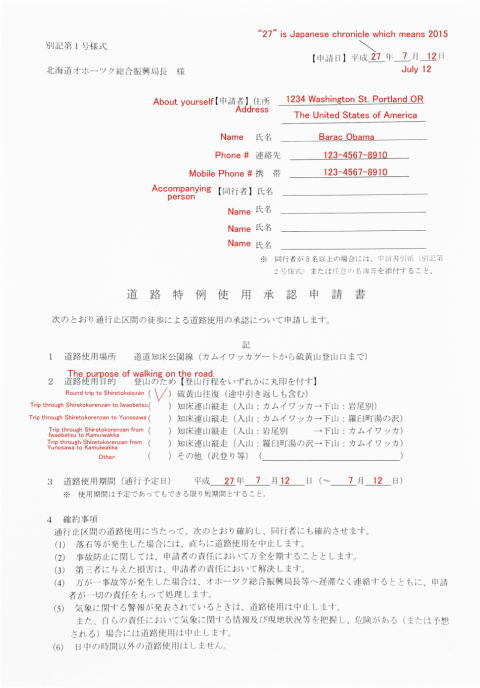 The form is written in only Japanese language. I wrote the example in red ink above. So just fill in and post it to the post box on the right. 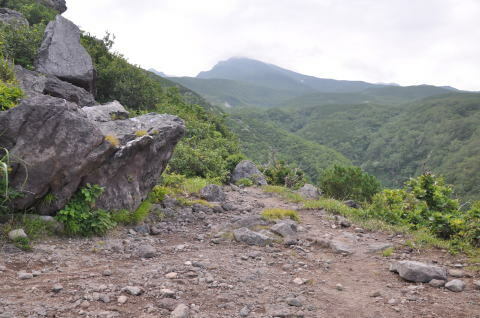 The local government says this 500-meters road ahead between Kamuiwakka Bus Stop and the Starting point of Mountain Trail is dangerous to walk due to falling rocks. This is the application of permission to walk on the road ahead. When you post the form, then you are permitted. Easy. It is safe enough. Japanese public governments like regulations. After you post the document to the box, you can just walk between the gate and the fence beside and walk for 500 meters to the start of the trail. 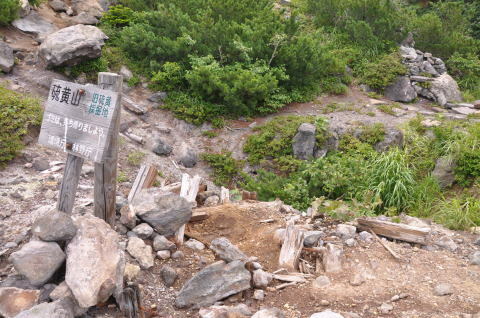 This is the start of mountain trail to the summit of Shiretokoiozan though we will climb up to the Crater One just a quarter of the whole way to the summit. You might see some bears in the trail. I recommend you to carry a bell with you. You can rent a counter bear spray at Shiretoko Nature Center but I do not think it is necessary. I have one but have never used it. At the beginning the trail goes very steep slope for about fifty meters and when you finished climbing the hard slope there is a sign. The trail turns right there then you might find the trail goes leftward too. From this point we will walk on an old path which sulfur miners used. The old trail, which is not used now, goes down to the cliff on the sea. Walking for 40 or 50 minutes you will be reach at a platform with no trees above. 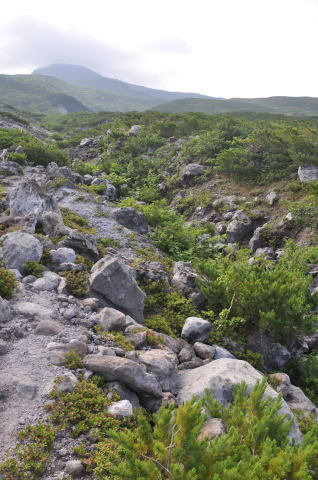 You could outlook for Kamuiwakka Creek and summit area of Shiretokoiozan. Let us look down the deep creek, Kamuiwakka. You might see steam coming up from some parts in the creek. Very acid hot spring water flow s down in this creek. All the water in this creek is hot spring. In 1936 the Crater One, where we will see later, eruppted 200,000 tons of molten sulfur and the brown liquid flowed into this Kamuiwakka Creek and fulfilled. You can see no sulfur today because the sulfur was mined for gun powder after the eruption. 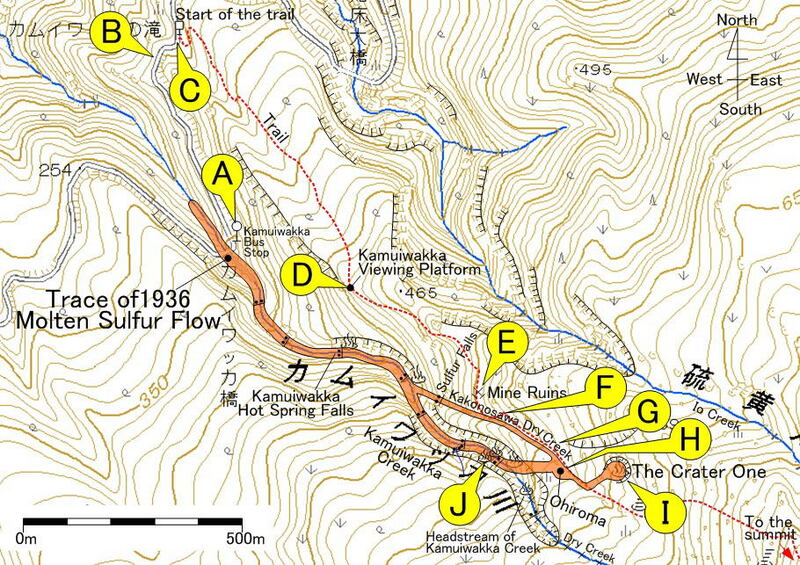 You can see "Sulfur Falls" from the outlook site. 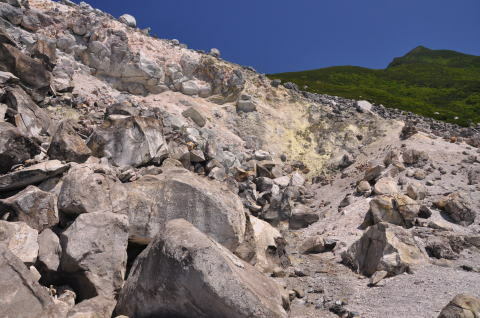 Dr. Watanabe who took this photograph wrote in his article that the molten sulfur falled with thundering roar. The trail goes through low pine bushes. You might see the outcrop in this photograph. It is a section of large sheet lava of andesite. This volcano composed of many andesite lava sheet like this photograph. For ten or twenty minutes walk you will see a artificial rock wall. A platform with big hole is above the wall. This is a ruin of old sulfur mine. Still it smells sulfur gas here. The trail goes in Kakosawa Dry Creek. The creek, where molten sulfur flowed at 1936-eruption, is full of huge rocks. 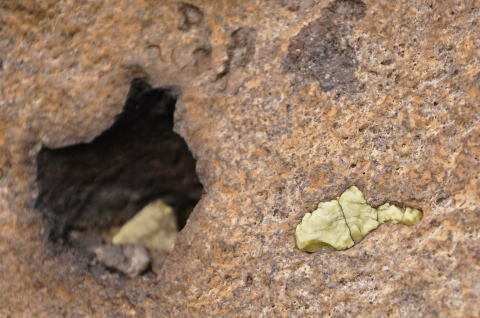 You can find small pieces of sulfur on the rock surface. The creek was full of sulfur during that days. Still some sulfur remains here. Some pieces of sulfur has small cavities. The molten sulfur contained volcanic gas in it and when it cooled and solidified, the gas made bubbles and they became cavities. However the sulfur piece in this photograph does not have cavities. When you complete climbing the huge rocks and artificial stone wall, you will see rocky bare hill. 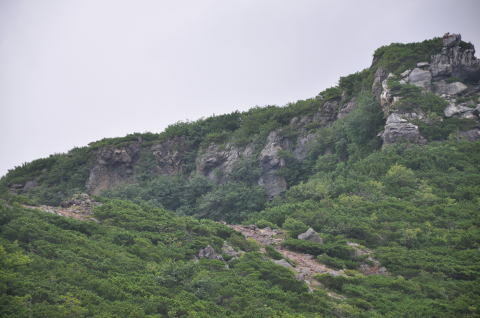 This no-tree area is called "Shinfunkako" by mountain climbers. Due to acid poisonous volcanic gas and geothermal heat, trees cannot grow but only small bushes can live. 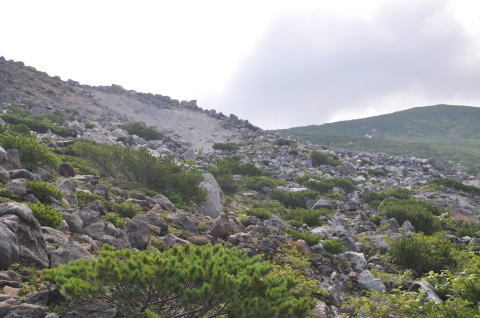 You can see the summit of 1562 meters Shiretokoiozan and on the left there is a white wall made of sand and clay. The sulfur eruption crater, the Crater One is located just behind this white wall. 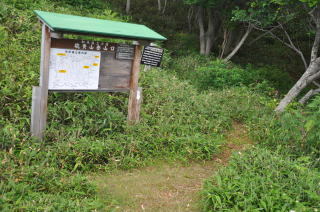 The mountain trail goes along Kakonosawa Cry Creek on the right showed in the photograph above. 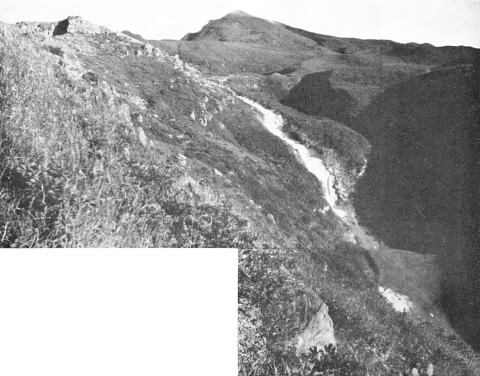 As this old photograph shows you, molten sulfur flowed in this creek in 1936. Still you can find some pieces of sulfur in the creek. Watch closely. It has cavities and small rock pieces in it. 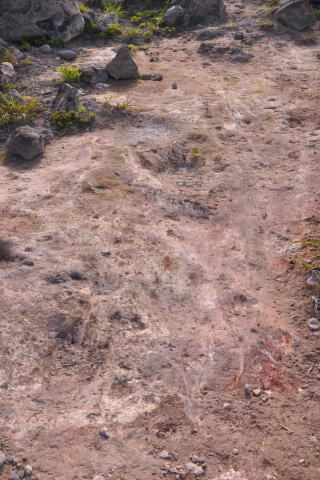 The trail goes through a pink clay area. The path is very slippy and many mountain climbers have slipped to fall here. Let's touch on the ground. It is warm. Due to the heat sometimes snakes sleep here. You will see a sunken ground forward called "Ohiroma." I guess it is a pit crater which ground subsided. 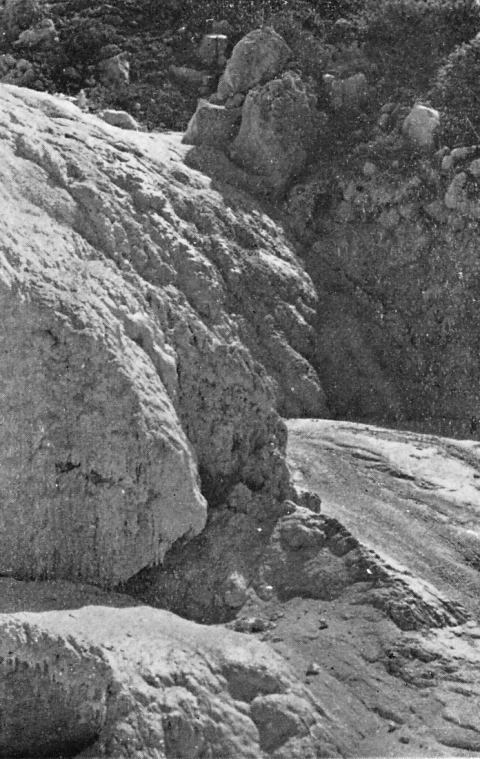 Duirng the erupiton in 1936, Ohiroma was filled with sulfur like the photgraph above. 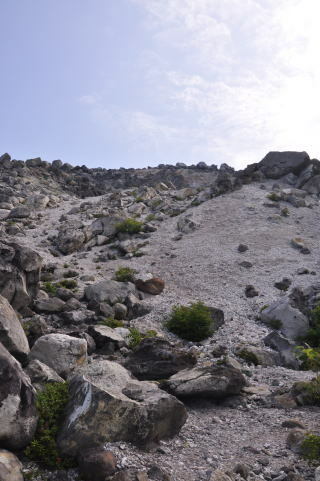 Let us proceed along the trail and after walking for around 50 meters from Ohiroma, you will see a steep slope with white gravels on your left. Climb up the gravel slope some how. 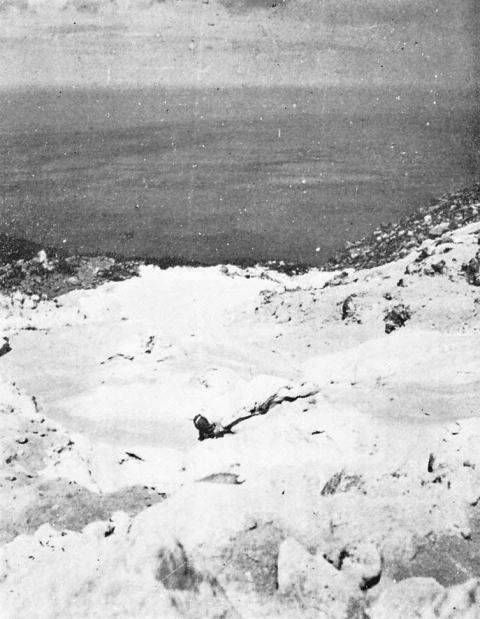 The Crater One is above this white gravel slope. The white gravels were altered by volcanic gas and heat. colorred minerals decayed and outflowed from the rock and white minerals and clay remained. Those white rocks are fragile and light. The Crater One is over the top of the while gravel hill. Now we have arrived at the Crater One. There are several fumarole puffing volcanic gas in the crater. 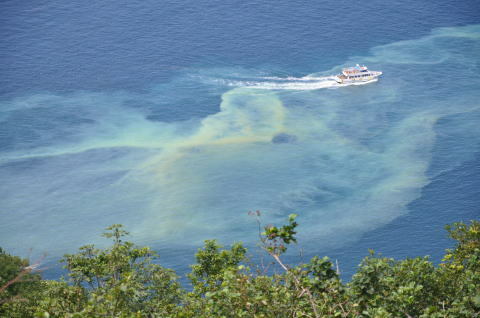 The volcanic gas contains toxic hydrogen sulfide and water vapor. You smell boiling egg: it is hydrogen sulfide. The concentration of the hydrogen sulfide of a fumarole is around 10,000 ppm (Sept. 13, 2014). If you inhaled 1000 ppm of hydrogen sulfide, one thenth of the concentration, you might die right away. But fortunately western part of the crater is open and strong wind comes through, you do not have to worry about the toxic gas so much. When you are close to fumaroles, just hold your breath. I will continue writing later.